Cloud computing can be tailor-made for improving the bottom lines of small and medium businesses. Not only can it deliver a “digitized” business model for a lower cost, but it can also take away a lot of the technical complexity and hassle—freeing up management to focus on growing their businesses. It’s not surprising, then, that in the United States alone, the SMB cloud services market grew by 25 percent in 2011 to reach $15.1 billion and, globally, it is predicted to hit $68 billion by 2014 (according to the software provider Parallels). Anyone who reads cloud computing marketing materials will be aware of the major benefits promised: IT cost savings of up to 60 percent, virtually no up-front investment, effortless and unlimited scalability of services, high resilience and availability, instant service provisioning, simple 'pay for only what you use' billing, and the claims go on. These are especially attractive promises to resource-stretched SMBs. So, when compared with traditional “on-premise” IT, who can blame growing companies for wanting to jump right into the cloud? But a more careful look beyond the hype reveals that decisions about migrating the software or IT infrastructure that you count on to run your business to the cloud are not always straightforward. Often lost in the hype is the fact that the cloud is all about making trade-offs: trading fixed/capital costs for variable/operating costs, gaining sharing resources, giving up direct control of your IT systems to gain flexibility and agility, and so on. Making sure the trade-offs are right for your company can be downright nerve-wracking. Well-thought-out cloud strategies can create major positive returns for small and midsize businesses. For example, moving to the cloud can free up your limited resources from working on low-value activities (such as maintaining the accounting system) to focus on higher-value activities (such as selling more, delivering better services or investing in customer content delivery). On the other hand, poorly- thought-out cloud ventures can destroy value through, for example, experiencing unexpected costs, losing control over who holds or sees your data, losing IT skills and knowledge, or jeopardizing your reputation with customers if services are no longer reliable or information is not secure. - Costs of bringing IT back in-house or transferring to another vendor after deciding to terminate a contract. For some SMBs, these factors can be managed or are outweighed by the benefits. But for others, they negate moving to certain types of cloud offerings or may cancel out the value of moving to the cloud altogether. No matter how simple the cloud may sound, any decision around managing fundamental aspects of your business is an important one. It could, for example, mean the difference between whether or not you gain the edge over your competitors in terms of service and efficiency. To make sure your decision is right for your business, you need to consider both sides of the question before committing to a move. With literally thousands of cloud providers and service options available, it is not practical to evaluate all their relative costs and benefits. So to help guide companies in their decision, ISACA, a global non-profit IT organization, recently released a complimentary white paper titled “Calculating Cloud ROI From the Customer Perspective.” The paper outlines a simple, beyond-the-hype approach for organizations of all sizes – including SMBs -- to estimate the return on investment of adopting cloud computing. - Balance the need to be accurate with the need to reach a decision. An overly complex ROI calculation can make it hard to understand why a decision was made or to measure its impact. Do as thorough a job as possible, but don’t let perfect be the enemy of good. - Cloud is not right for every need. The type of cloud service selected—and the decision to use cloud services -- depends on your company’s risk appetite. - It is far easier and less costly to change a decision when it is still on the drawing board. The time that you spend considering the ROI of various options and selecting the best fit for its needs is time well spent. The paper also outlines a step-by-step process to make objective, informed decisions on cloud computing options to help you achieve a positive payback over the long term. 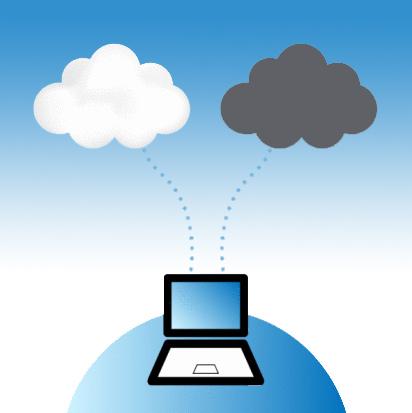 Cloud computing presents tremendous opportunities for many SMBs. Sorting through the options may seem like a difficult task. But with a little guidance, research and planning, you can cut through the hype and make the right decision for your growing company. Ron Speed, CISA, CRISC, CCSK, CA, is principal consultant with TrustedImpact (www.trustedimpact.com).